It's the Queen's Birthday long weekend in Sydney, but we have no plans to go anywhere. The weather is cold, windy, gloomy and wet. Great weather for sleeping in under the doona/quilt, 'veging' in front of the telly - all indoor activities where it's warm and cosy. It's also the right weather for warm comforting food like soups. Heat oven to 160C. Place the pumpkin, onions, garlic and rosemary on a baking tray that is lined with baking paper. Drizzle with olive oil and sprinkle sea salt and fresh ground black pepper over them. Toss together to ensure the vegetables are coat in oil. Place the tray into the oven to roast vegetables for 20 minutes or until pumpkin is soft. Leave aside to cool. In a medium size stock pot, bring the water to boil and then place the chicken breast in to make the stock. Bring to boil and lower the heat; leave the stock to simmer for about 45mins to 1 hour. Add in the roasted pumpkin, onions, garlic and rosemary into the stock. Using a handheld blender, blitz the vegies until all mashed together. Season the soup to taste. Serve with a bread roll. Love your recipes. My family enjoys pumpkin soup for weekend lunches. Your version is interesting. Mine involves stir frying the cubed pumpkin pieces with a little butter and chopped big onions until soft. I also leave the diced chicken in the soup and blend everything up so the soup is more substantial. Cheers! I always wonder how to make those tasty pumpkin soup. Pumpkin is cheap yet delicious and nutritious. Thanks for sharing you recipe. Judy: I love the idea of adding the chicken into the soup to make it more substantial. Might give it a go next time. Agnes: It's easy and great for weekend lunches. In fact, my eldest girl likes them for school lunches too (kept warm in a thermos). BTW, might have to ask you about places to visit and makan in KK. We will be there in Sept.
Can't go wrong with that tasty looking soup. 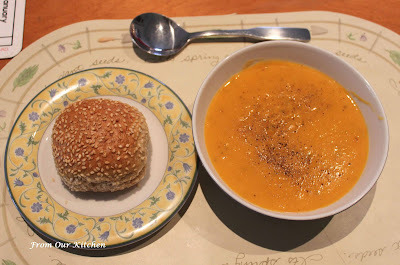 We have been eating copious amounts of pumpkin soup this winter. Usually I make stock from leftover roasted chicken, and whatever roast veges we had left also goes into the soup. Recycling!